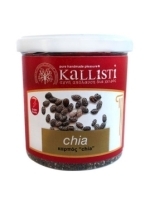 Chia seeds are tiny black seeds from the plant Salvia Hispanica, which is related to the mint. They prized them for their ability to provide sustainable energy.Despite their tiny size, chia seeds are among the most nutritious foods on the planet. They are loaded with fiber, protein, Omega-3 fatty acids and various micronutrients.Chia seeds are high in antioxidants that help to protect the delicate fats in the seeds. They also have various benefits for health. They are a natural supplement that may be consumed daily.